Prosecutors started to unveil what they call a "treasure trove of evidence" on day 2 of the 'El Chapo' trial in Manhattan Wednesday. Gus Rosendale reports. An admitted former Mexican cartel member first met the notorious drug lord Joaquin "El Chapo" Guzman when he helped him evade a manhunt, he said in court testimony Wednesday. Taking the witness stand for the government at Guzman's U.S. trial, Jesus Zambada identified Guzman in the courtroom and told jurors he "was one of the most powerful drug-traffickers in Mexico," detailing how the Sianola cartel made massive profits by smuggling ton-upon-ton of cocaine into the United States. Zambada - a 57-year-old trained accountant who was arrested in 2008 and is still in U.S. custody - was the first of several cooperators expected to give jurors an inside look at a cartel with a legendary lust for drugs, cash and violence. Appearing in a blue jail uniform and wearing tinted glasses, Zambada testified when special military forces were trying to hunt down Guzman in 2001 after a prison break, he was tasked with trying to find a spot where the cartel could land a helicopter for its boss. "We were rescuing him ... because the military was about to recapture him," the witness said through a Spanish interpreter. Zambada said for most of the 2000s, his brother, Ismael "El Mayo" Zambada, and Guzman were considered the top leaders of the Sianola cartel as it imported large shipments of Colombian cocaine by land, sea and air to Mexico before using various means to get it to the U.S. market. A popular smuggling method involved stashing the drugs in containers hidden inside gas tanker trucks filled with fuel, he said. As the cocaine was moved north, its profit potential skyrocketed, he said. A kilo purchased in Colombia for $3,000 would fetch $20,000 in Los Angeles, $25,000 in Chicago and $35,000 in New York City, he said. Zambada testified he ran a cartel warehouse in Mexico City that processed 80 to 100 tons of cocaine a year, a volume that that brought in "billions" in revenue. Through bribes, he claimed, "I controlled the airport in Mexico City. ... Controlled the authority." The testimony, which was to continue Thursday, came on the second day of the trial in Brooklyn federal court, where Guzman pleaded not guilty to drug-trafficking charges after being extradicted to the U.S. last year. The defense has described the cooperating witnesses like Zambada as liars seeking to reduce their own sentences. "They're here because they want to get out of jail by any means necessary," a member of Guzman's defense team, Jeffrey Lichtman, said Wednesday in a continuation of an opening statement that began Tuesday. Despite his diminutive stature and nickname that means "Shorty" in Spanish, Guzman was once a larger-than-life kingpin both feared and admired in Mexico. The defense has sought to counter that reputation by portraying him as lesser figure in a drug gang it says was actually under the control of Ismael Zambada, who's still at large. Before Wednesday's testimony, U.S. District Judge Brian Cogan admonished Lichtman for using his opening statement to claim, without proof or any relevance, Ismael Zambada remains free because he bribed the current and former presidents of Mexico. Mexican President Enrique Pena Nieto and former President Felipe Calderon both dismissed the allegations as completely false. Earlier Wednesday, federal prosecutors gave jurors a video tour of a tunnel between Mexico and an Arizona warehouse - a corridor Guzman allegedly used to speed drug deliveries to America. The warehouse was just two blocks from a U.S. Customs office in the border city of Douglas. Retired U.S. Customs Agent Carlos Salazar, the trial's first witness, told jurors agents were surprised at how sophisticated the tunnel was, saying it contained equipment that might be found in a car repair shop. 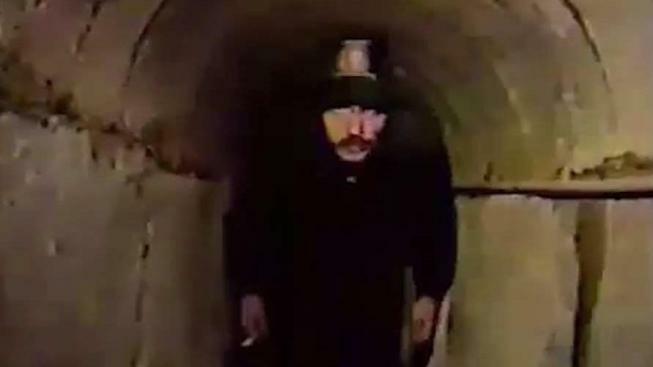 The tunnel was half the length of a football field and large enough that a 5-foot-8-inch man barely had to lower his head to walk through it. It was equipped with electric lights, an industrial-sized weigh scale and a hydraulic system to lift away flooring that was covered by a pool table. Authorities used heavy tools to smash through concrete, Salazar said, only to realize later it all would have opened up on the Mexican side with the twist of a water faucet valve. "We didn't know the floor came up," he said.